Customers will be notified by phone using the cell phone listed on the account. Customers may choose to receive a text message instead of a phone call. If you choose the "text message preference", please inform the office by calling 228-255-5813 otherwise you will automatically receive a phone call. 1.) Main office door (mail slot) at 4425 Park Ten Dr. 2.) Drop box in circle drive at 4425 Park Ten Dr. Please do not place cash in drop boxes. We understand that problems occur at anytime & our staff is pleased to provide you with 24 hour service in the event of a water or sewer emergency. Sealed bids for the construction of the “Lift Station No. 13 Force Main” will be received by, and addressed to, Attention: GENERAL MANAGER, DIAMONDHEAD WATER AND SEWER DISTRICT, (“OWNER”), at the District’s office located at, 4425 Park Ten Drive, Diamondhead, Hancock County, Mississippi 39525, until 4:00 p.m. Central Time, Thursday, April 25, 2019. Bids will be opened later that evening during the Diamondhead Water and Sewer District Board of Commissioners Meeting at 6:00 pm in the Council Chambers of Diamondhead City Hall, 5000 Diamondhead Circle, Diamondhead, MS 39525. The Lift Station No. 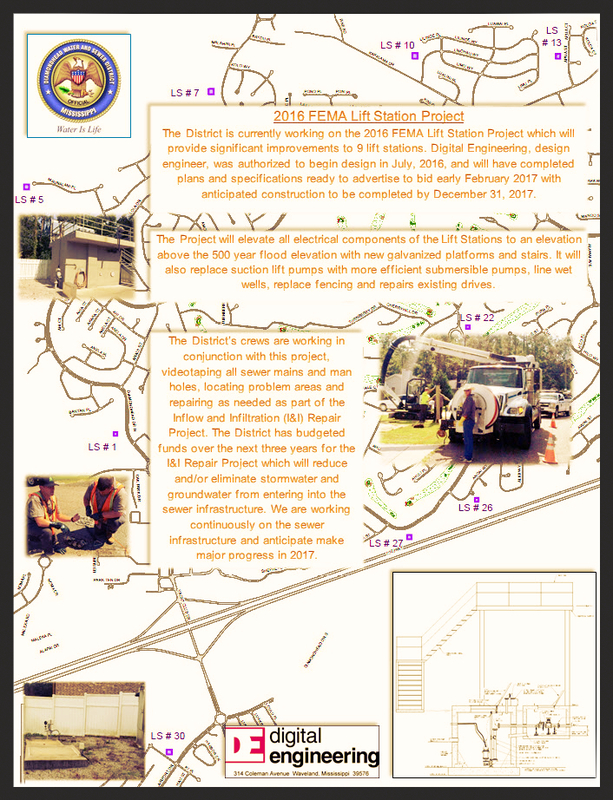 13 Force Main requires the successful Bidder to construct approximately 4,300 LF of 8” PVC Sewer Force Main, connections to existing force mains and sewer manholes, directional boring, valves, 18” PVC gravity sewer main, and manholes in accordance with the specifications. The project work shall include construction of all facilities and furnishing of all equipment required to complete, test, and make ready for use by the Owner all structures, equipment, and systems, together with the establishment of vegetation as specified in the Contract Documents. Contract Documents may be examined at: (1) Diamondhead Water and Sewer District located at 4425 Park Ten Drive, Diamondhead, MS 39525, Phone: (228) 255-5813 (Extension 225); or (2) Seymour Engineering, Inc. located at 925 Tommy Munro Dr., Suite G, Biloxi, MS 39532, Phone: (228) 385-2350. Bids may be submitted electronically at www.SeymourEngPlans.com until the time specified. All Prospective Bidders and Plan Holders are required to register for an account and log-in at www.SeymourEngPlans.com. At this site, plans can be viewed at no charge or physically purchased. All Prospective Bidders and Plan Holders must have a valid email address for registration. Purchased bid documents are non-refundable and must be purchased through the website. Bids submitted via sealed envelope must be clearly marked: “LIFT STATION NO. 13 FORCE MAIN” SEALED BID and addressed to: General Manager, Diamondhead Water and Sewer District, 4425 Park Ten Drive, Diamondhead, Hancock County, Mississippi, 39525. Bids received after the specified time will be returned unopened. All questions pertaining to clarification of the bidding documents shall be directed in writing to Matthew Hosey, P.E. at matthew.hosey@waggonereng.com & Reed Bryant, P.E. at rbryant@seymoureng.com. Each Bid shall be submitted in accordance with the Instructions to Bidders and shall be accompanied by the Bid Security (as defined in Section 00100 Instructions to Bidders) in the amount of not less than five percent (5%) of the Bid. The Bid Bond may be from a surety acceptable to the Owner satisfying the requirements specified in the Contract Documents or Certified Check upon a national (legally recognized to conduct business in the State of Mississippi) or state bank, payable without recourse to the Diamondhead Water and Sewer District as a guarantee that the Bidder will within fifteen (15) days after the Notice of Award enter into a Contract. The Successful Bidder must furnish a Performance Bond and a Payment Bond equal to 100% of the Contract amount each with a surety company acceptable to the OWNER and in a form acceptable to the OWNER. Bids may be modified or withdrawn at any time prior to the time set for opening Bids. Bidders may not withdraw their Bids for a period of ninety (90) calendar days after the actual date of the opening of the Bids. Complete instructions for filing Bids are included in the Instructions to Bidders. The Owner reserves the right after opening Bids to reject any or all Bids, to waive any informality (nonresponsiveness) in a Bid, or to make award to the lowest and best qualified, responsive, and responsible Bidder and reject all other Bids, as it may best serve the interest of the OWNER. 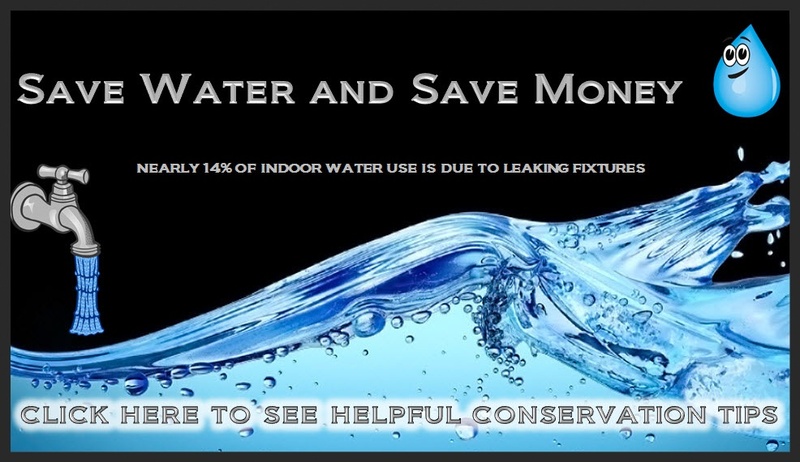 There are many ways to reduce your household water use and lower your bill. Please click on the link below for tips on finding leaks, repairing leaks, and ways to conserve water.